Entering Carlisle from the South East, after exiting the M6 at junction 42, travelling along London Road, then Bothchergate, brings you to the Southern gates of the city. Here, at the Northern extremes of Botchergate, and the Southern end of English Street, the magnificent Citadel stands guard over the Southern most entrance to the city. Above. The Citadel from Botcher Gate. Originally, this defensible entrance would have consisted of two massive stone built towers, with a u-shaped bastion behind it. On the West side of these structures, was the ancient English Gate, and in the centre was the Botchard Gate (which gives its name to the present road, Botcher Gate) On both the East and West sides of this structure, huge triangular artillery platforms were constructed, capable of housing cannon, with the round towers providing more defensive capabilities against any would be attackers. The walls were probably around 3 metres thick, reflecting the need for walls capable of holding heavy artillery, and withstanding any artillery attack on the Southern most part of the city’s defences. These days, of the two original towers, only the Eastern tower survives. 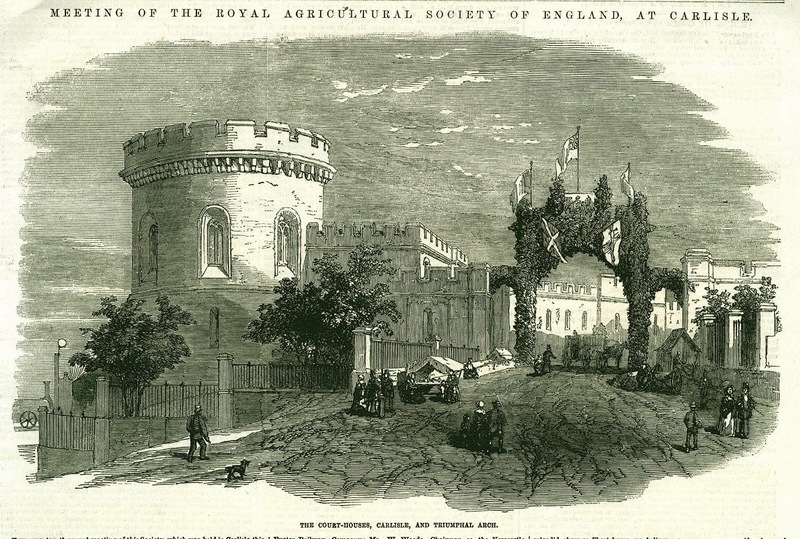 An excellent re-creation of the Western tower was erected on the site of the original during the period 1810 to 1817. 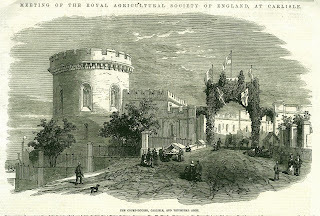 This tower was designed by Sir Robert Smirke, who did extensive work on Lowther Castle, and was intended to be as similar to the original mid 16th century tower as possible. This tower housed the assize courts. The main interest here, is the Eastern tower. 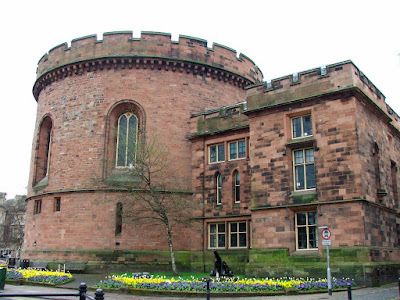 This tower is largely original, being built in 1542 by Stephen von Haschenperg, with early 19th century alterations by Thomas Telford and Sir Robert Smirke. During renovation work conducted in the 1980’s much of the original 16th century external stone was replaced, thus making the two towers look as if they are of the same period. 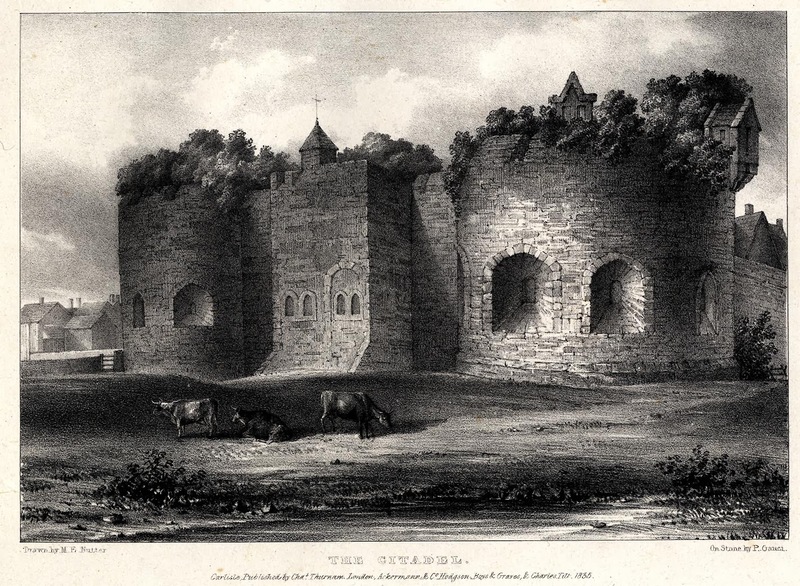 Work on the Southern most defences of the city were initiated by Henry VIII and were deemed essential in view of the strength of feeling in Continental Europe against the Crown's abolishment of the abbeys and monasteries of the United Kingdom. 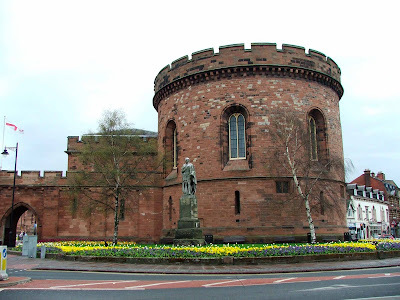 The Crown employed Stephen von Haschenperg to re-inforce and bring the existing defences up to date, and building work was undertaken at the castle, and at the old point of entry to the city from the South. 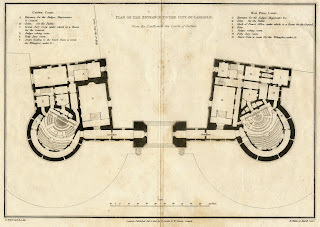 The new citadel that was constructed was meant to be a massive artillery platform, with earthworks and a massive water filled ditch in front of it. The idea was for the defenders of the city, to be able to bring down a huge amount of cannon fire on anyone attempting to enter via the Southern gates. Above. 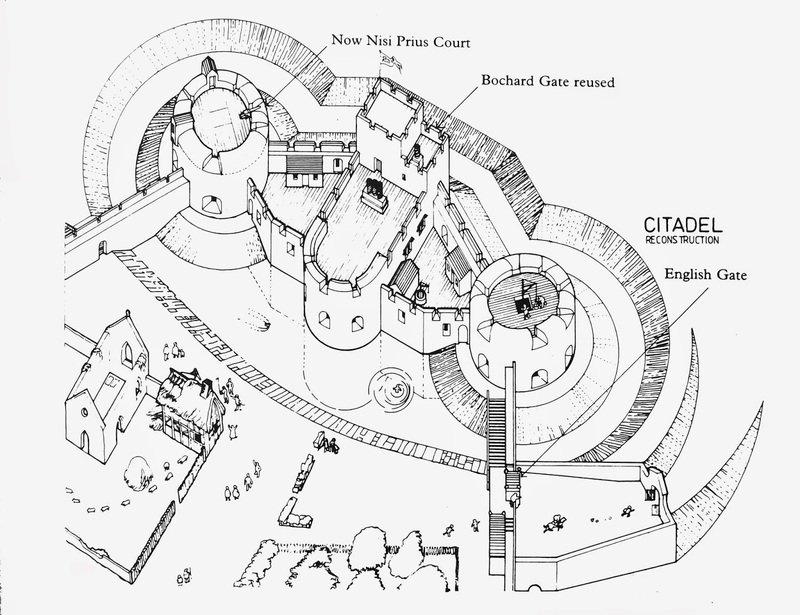 Diagram showing the original set out of the Citadel, including earthworks that are no longer visible. 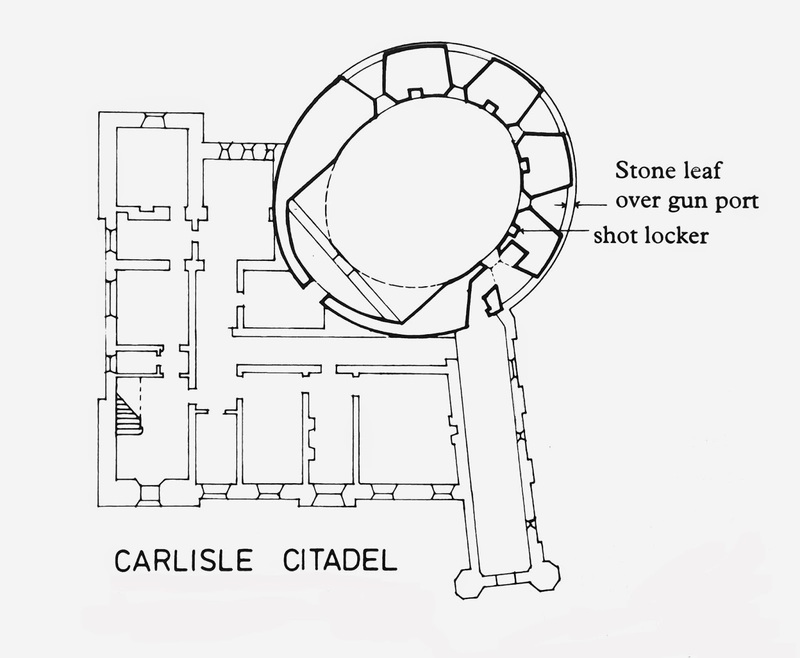 Although the citadel was built and completed in 1542, by 1545 the promised artillery (cannons of various sizes) had still not arrived. 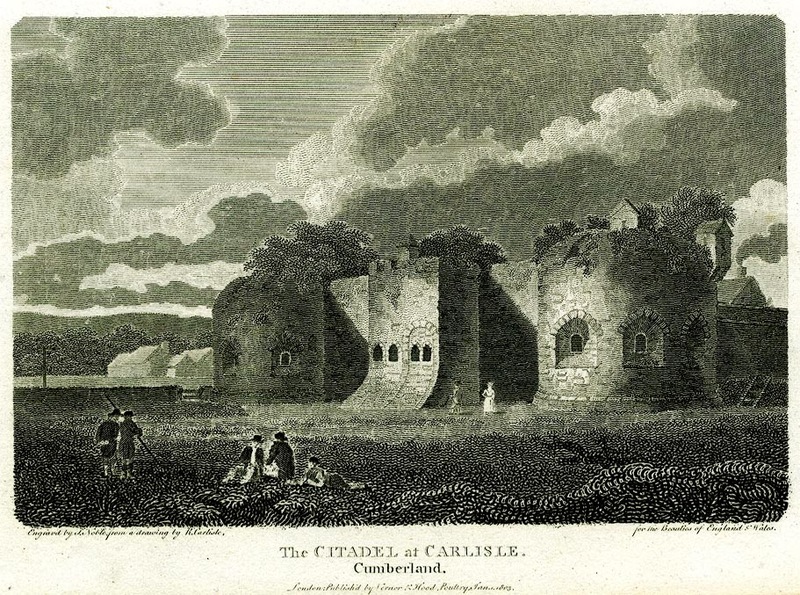 Carlisles artillery defences were said to be meagre, with 'only one aged gunner between castle and citadel'. 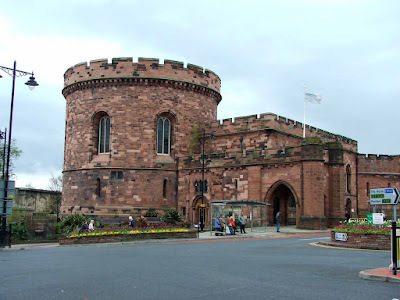 Unsurprisingly, the citizens of Carlisle were said to have been a little upset with this state of affairs, and offered to pay for the required weaponry. 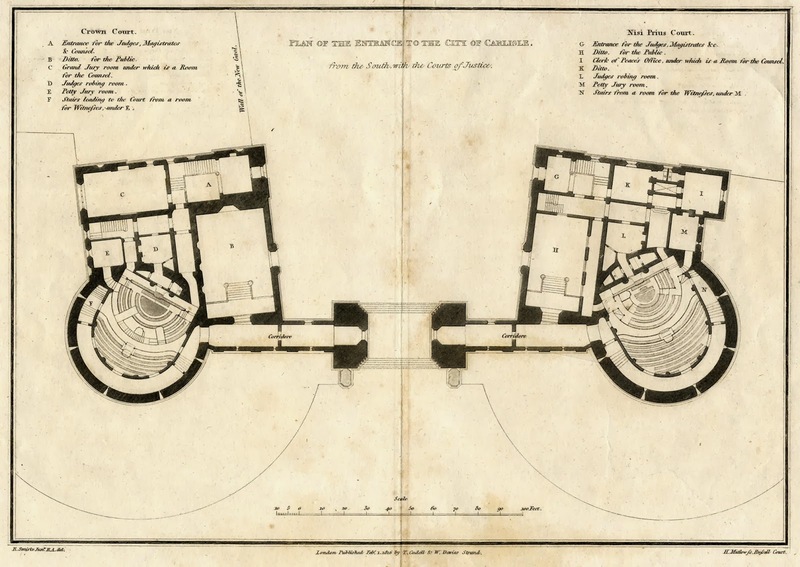 It probably came as no surprise that Henry agreed with this plan, and the city's defences were brought up to date. By way of an apology, Henry provided the city with a force of some 500 or 600 men to man the new defences. 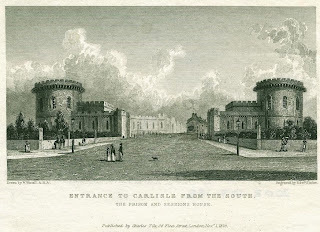 These days, the Citadel provides a rather grand introduction for those driving into Carlisle from the South, and for those arriving in Carlisle by train.